Everything is filtered through the lens of the heart. It’s the source of our perceptions and understanding; therefore, it stands to reason that the heart calls the shots in our decision making. It’s at the core of our being. Every experience passes through the heart. Every interaction is registered in the heart. The heart is involved in every facet of our lives. It’s the entry point for good or bad. It’s the seat of our emotions. That’s why the Word of God urges us to aggressively guard our hearts. 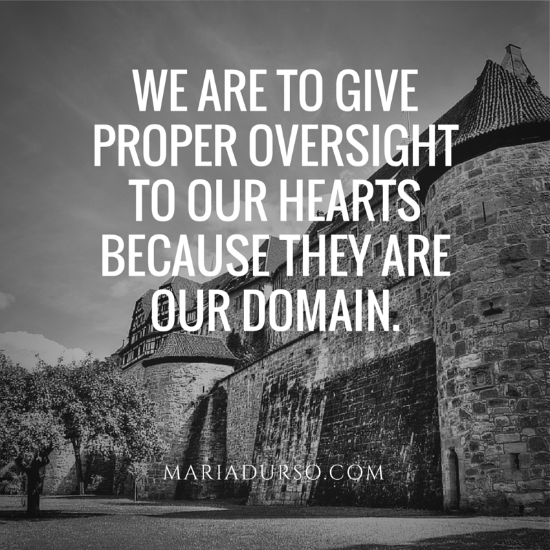 We are to give proper oversight to our hearts because they are our domain. The heart is a city, a metropolis, a universe within itself. Wars are fought on the bloody battlefield of the heart, and victory or defeat is determined in the heart. Matthew 15:19 says out of the heart come evil thoughts, murder, sexual immorality, adultery, slander, and false testimony. So sin is conceived in the heart. The brain in the heart conjures up these destructive behaviors. Proverbs 12:25 says, “Anxiety in the heart causes depression.” Fearful thoughts stored in the heart cause the heart to be weighed down or to sink. Jeremiah 17:9 tells us, “The heart is more deceitful than all things and desperately wicked; who can understand it?” (mev). Wow! You can’t possibly understand your own heart and its motives. Matthew 12:34 says, “Out of the abundance of the heart the mouth speaks” (nkjv). The heart has a 75 voice. Our lips are just parroting what our hearts are thinking. Psalm 14:1 says, “The fool has said in his heart, ‘There is no God’” (mev). Atheism is a heart problem. Psalm 34:18 tells us that the heart can be broken. Thank God He binds up our broken hearts. First John 3:20 informs us that our hearts can feel condemned at times. But on the positive side, the heart has the capability of being pure. Matthew 5:8 says, “Blessed are the pure in heart, for they shall see God” (mev). The heart is capable of total surrender. If this were not possible, then God would not command us to love the Lord with our whole heart. Our first experience with salvation takes place in the heart. We believe in our heart and then confess with our mouth (Rom. 10:9). Psalm 119:11 says, “Your word I have hidden in my heart, that I might not sin against You” (mev). The heart is a hiding place, a storage bin, a treasure chest. As we discussed earlier, the heart has the capability to think. Proverbs 23:7 says that as a man thinks in his heart, so is he. It doesn’t say as a man thinks in his head; no, it says as a man thinks in his heart! That’s why we must diligently keep watch over our hearts, because the heart has its own brain. Thus we really do live from the inside out! It’s time to wash the inside of the cup. It’s time for a brain wash!